A newborn typically deprives parents of 400 to 750 hours of sleep in the first year of its life. It’s hardly surprising that sleep and sleep-training is the #1 issue faced by new parents. Many mothers and fathers wrestle with the overwhelming number of sleep-training methods offered to them, from the “cry-it-out” techniques to the gentler “no-cry” approaches. But there are no scientific studies that prove one method is superior to any other. 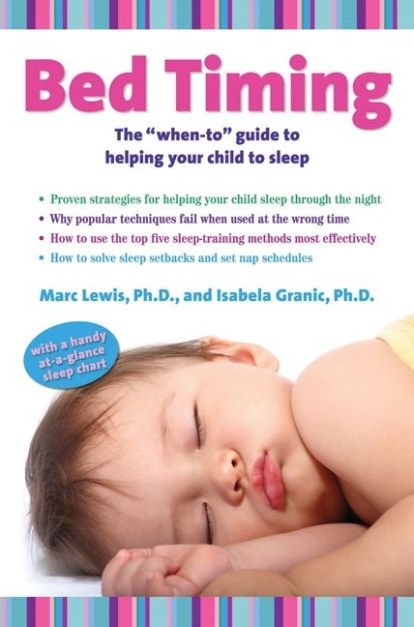 Lewis and Granic, however, have uncovered astonishing research and crucial information about sleep-training babies: the most critical factor is when you start the process. Timing is everything. The Sleep Time Solution walks you through the stages of your child’s development up to the age of four, revealing the windows during which sleep-training is most effective—and when it stands the least chance of success. With this knowledge, you can decide when and how to teach your child to sleep through the night. The Ferber method, for example, is appropriate for the five-to-seven-month stage, when infants are emotionally resilient, but potentially disastrous in the eight-to-twelve-month stage, when they develop separation distress. Filled with practical advice on the top five sleep-training methods and instructions for dealing with sleep setbacks, The Sleep Time Solution is a simple, sensible and reassuring guide to help your child—and yourself— get to sleep. Marc Lewis, Ph.D., and Isabela Granic, Ph.D., are developmental psychologists as well as the parents of twins. Dr. Granic is a research scientist at the Hospital for Sick Children. Dr. Lewis is a professor in the department of human development and applied psychology at the University of Toronto. Together, they have been guests on international public radio programs, spoken at international academic conferences and given educational seminars and workshops to parents and clinicians around the world. Lewis, Granic and their children live in Toronto.